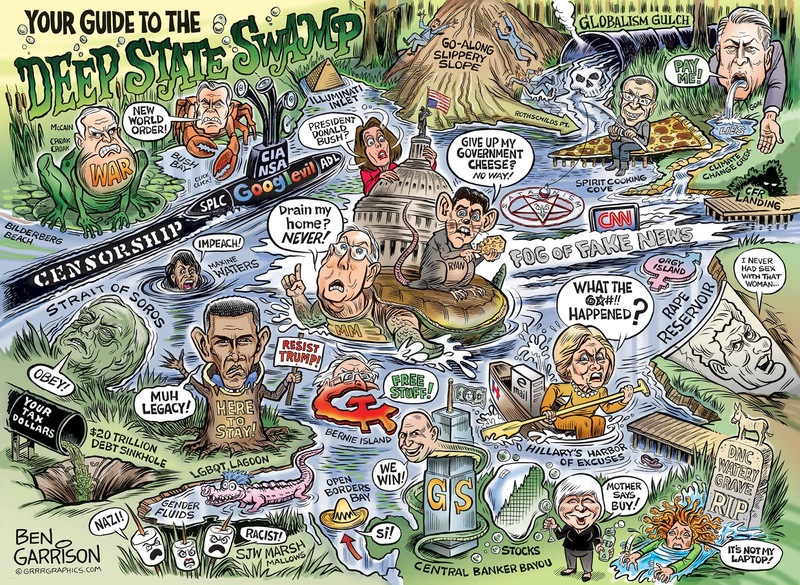 Rogue Cartoonist: "Your Guide to The Deep State Swamp"
"Your Guide to The Deep State Swamp"
Trump’s election confirmed one thing for certain: The Deep State is real and spectacular in terms of evil. Their dedication to removing our president from power is relentless. They will continue to work against him and if Trump backs off from any of his campaign promises, they’ll use that against him and claim victory. This is currently being done with his ambivalence on the ‘dreamers,’ which is a lefty name designed to garner sympathy for illegal aliens. My cartoon shows some of the central players involved in the Deep State. Prominently featured is George Soros. He wants to break America and Europe and see western civilization replaced by a feudal, collectivist, globalist system. With the Illuminati firmly in charge, of course. Soros funds the Antifa and Black Lives Matter movements as well as massive immigration from African and muslim countries. Those low-IQ and under-skilled immigrants don’t assimilate well. They commit crime while demanding free stuff. The source of the swamp is evil itself. We know that many at the top are Satanic pedophiles. It’s sickening that we’re forced to cough up tax dollars as tribute for these monsters. They don’t even need our taxes—they’re perfectly able to print up as much money as they need, and they’ve done just that to prop up their stock market. We are forced to endure complicated tax forms and cough up our hard-earned money because the Deep State wants us kept poor, fearful and compliant. The tyrants know most people don’t want to lose their stuff and be hassled by the IRS. We go along and don’t push back enough. That attitude puts us on a slippery slope. We slide into the swamp and the Deep State wins. Currently they’re pushing for more taxes and control by means of their ‘climate change’ con, led by Al Gore. Those who question it are ridiculed, marginalized, or even threatened. Slippery slopes are created to keep people going along with the Deep State program when we should be rounding up people such as Soros. Hillary should have been locked up by now. The central bankers should be broken up and their Federal Reserve needs to be ended. There are many good people on the Internet who are exposing the Deep State and its legion of lies, but can it lead to real change? "The CIA Unleashed Upon Us All"